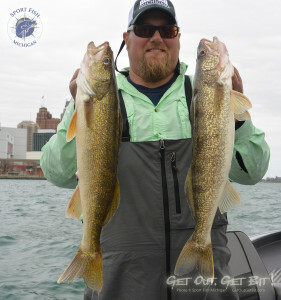 Having just returned from a very productive trip down to the Detroit River for some walleye jigging, now is a great time to discuss some of the particulars that make that fishery such an incredible one, and how anglers curious about fishing the Detroit River can get a head start towards success. With a DNR-estimated 10-12 million walleye running up the Detroit River to spawn, this urban setting transforms into a true world-class fishery. 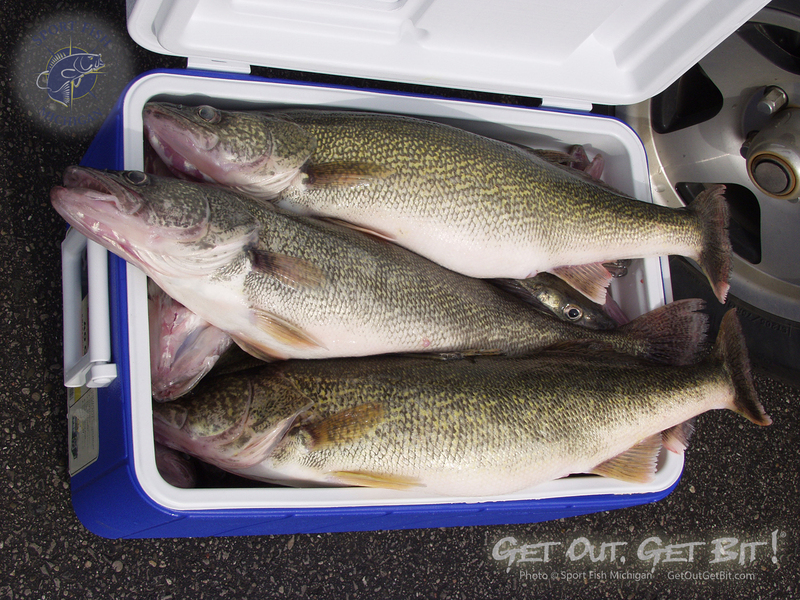 Not only for perfect eater-size walleyes, but for trophies, too. Fish over 10 pounds are fairly common in early April, and there are numerous fish over 12 and 13 pounds caught every year. Once the ice floes from Lake St. Clair subside in early April, walleyes begin to swim upstream from Lake Erie. This is the big fish time, and anglers in the know target giant walleyes during the first 2 or 3 weeks of April. The last portion of April, and through the first couple of weeks of May, is the time to target numbers as well as eaters. Eaters are generally sized between 1 and 4 pounds. These fish swarm the river once slightly warmer water begins flowing in late April. To catch these awesome eating fish, anglers tend to employ one of 2 basic methods. Handlining is a staple for many seasoned veterans. This technique covers lots of water, keeping lure presentations in the strike zone almost the entire time. What we at Sport Fish Michigan love is vertical jigging. Jigging the Detroit River is simple in principle, but much more complicated in the intricacies that make this technique so deadly. Generally speaking, jigs between half an ounce and an ounce are used to bounce along the river bottom while slipping down-current. The river is full of rocky snags, and bouncing the river’s bottom vs. dragging the bottom is critical to not snagging. Braided line is also a must for us, since the diameter of the line is far less than that of monofilament or fluorocarbon. It also allows for much more sensitivity, and anglers can feel each thump of the bottom affirming bottom contact, which is important information. Without this feedback, it’s all too easy to let the jig accidentally drag along the bottom, inevitably resulting in snags. Successful jigging motions can vary from day to day, but the rule of thumb tends to be small, short jigs, about 6 inches in height. With braided line, a 6 inch jigging motion moves much closer to 12 inches under the water. Small jigging motions allow for more contact with the bottom, where the walleyes hug in the river current. Additionally, a small jigging motion keeps the bait in the strike zone more of the time than does a longer jigging motion. 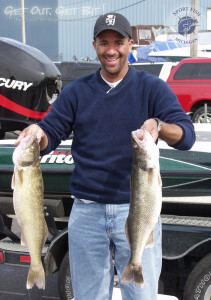 There are times, however, that walleyes will want a longer jigging motion. Experimenting each day will let anglers know what will trigger the fish on any given day. Sport Fish Michigan Captains tend to use similar tackle. Through trial and error, we have refined our techniques and tackle preferences to put our customers on the best fishing setups that we can. I prefer 8-10 pound braided line. If the water has a clarity of more than 2 feet, I also like to use a short fluorocarbon leader, about 2-3 feet or so. Walleyes typically don’t have time to inspect a bait closely due to the river’s current, so braided line tied directly to a jig is fine in most instances, but there are times that I am convinced that a short leader can lead to more bites. 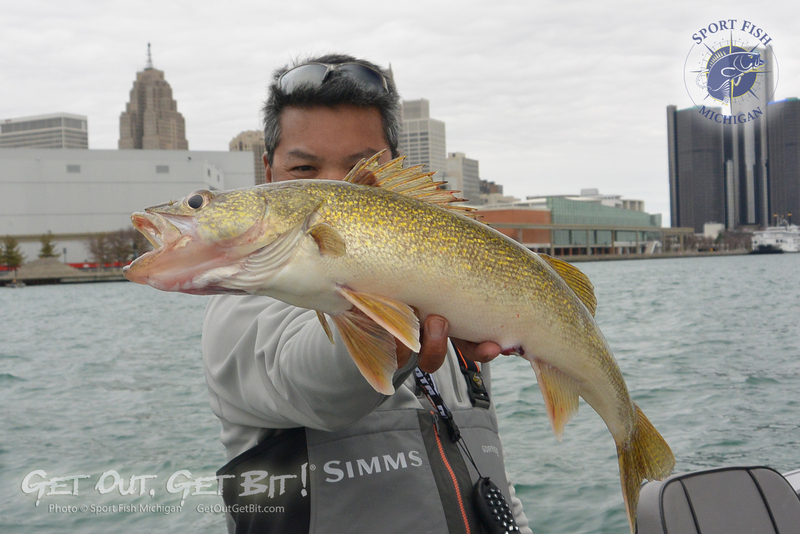 The use of a treble stinger hook on my jigs is a must, as walleyes will often strike short. Part of the reason for this is because walleyes don’t have a lot of time to look at a bait as it comes down in the swift river current. Using a stinger hook will help to hook these short-biters. Anglers use a variety of soft plastics on their jigs. While there are many different baits that will work, the 2 that I tend to use more than others are the Wyandotte Wonder worm and the Lunker City Fin S Fish. I have also used various paddle tail style baits with great success as well. Early in the spring, when waters coming out of Lake St. Clair are cold, I like to also tip my jig with a 3-4 inch minnow. I also use water temperature as a guide to whether to use a minnow on my jig or not. With water under 50 degrees, I am a firm believer in the use of a minnow. This was proven time and again this past week as a successful tactic. Waters were 44 degrees, and bites seemed to be almost immediate when we had a minnow. When we did not have a minnow on our jigs, bites were very few and far between. The Detroit River is a big river with lots of flow. Navigating through heavy boat traffic is something anglers must be conscious of before launching. This is also a shipping channel, and freighters and freighter wake are common. Make sure to have all of the boat’s safety equipment onboard and in good working order before getting out onto the river. And, as always, take care, be safe, and have fun on the water!